split second-row seats slide forward and back for added comfort and cargo flexibility. Jeep® Cargo Management System makes the most of rear cargo space, adding the versatility you need for your active lifestyle. 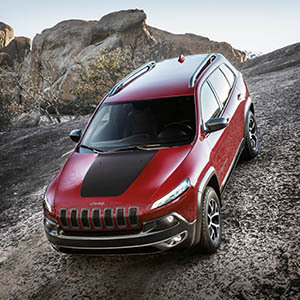 Available Mopar® accessories including a cargo bin, collapsible cooler, first aid/emergency kit and off – road accessory kit mount to the rear cargo module rack for secure storage solutions. The innovative Jeep® vehicle cargo management system adds handy hooks and a removable grocery bag holder as well as many innovative and thoughtful add-on storage solutions including a First Aid Kit. Accessories available through the Mopar® brand. personal communication and media devices to their vehicle’s electronic features. The All-New high-definition instrument 7” cluster is customizable to your individual tastes and offers crystal clear definition. You can scroll through user-friendly graphics with the touch of a button on the steering wheel keeping your eyes on the road. CommandView® dual-pane panoramic sunroof includes a sunshade and fixed glass pane in the rear. The class-exclusive Sky Slider® open air sunroof system opens up your world with a single push of a button.